It’s my friend Adam’s birthday! A while ago I told him I’d sew together a doll for him this special week, because nothing calls for celebration quite like birthdays. He asked for a plush version of Terezi Pyrope, his favorite of the cast from the popular webcomic Homestuck. In addition to being a recent internet sensation for a fandom the size of seven Norways and cause for many a cosplay (I actually had another friend recently dress up as Li’l CAL, which is beyond insane, bro), Andrew Hussie’s Homestuck, which began in 2009, also happens to be my least favorite thing ever. “If you, yknow, wanted it to be ugly,” my friend Nolan began, hesitantly, when he got a sneak peak of the unfinished product, “it’s ugly. But in a good way!” He then proceeded to finish his own project, a knit sky blue baby hat and matching scarf, and wrap the garments around an empty Snapple bottle as a companion for the doll (needless to say they immediately became best friends). In all honesty I did not try to make something this sad and unsettling. While normally I’d be the first to admit that my intentions contain a Grinch-like level of spite, birthdays are a sensitive thing for me! I’d never mess up on a birthday gift ever! Except that one time in third grade where I tried to give my language arts teacher a crumbly snowman made out of Crayola Model Magic. That was a pretty good example of messing. Thankfully the doll’s felt came from Joann’s at $0.34 a sheet. Four for a buck, can you believe that? I might just have a craft-mom aneurysm over here. 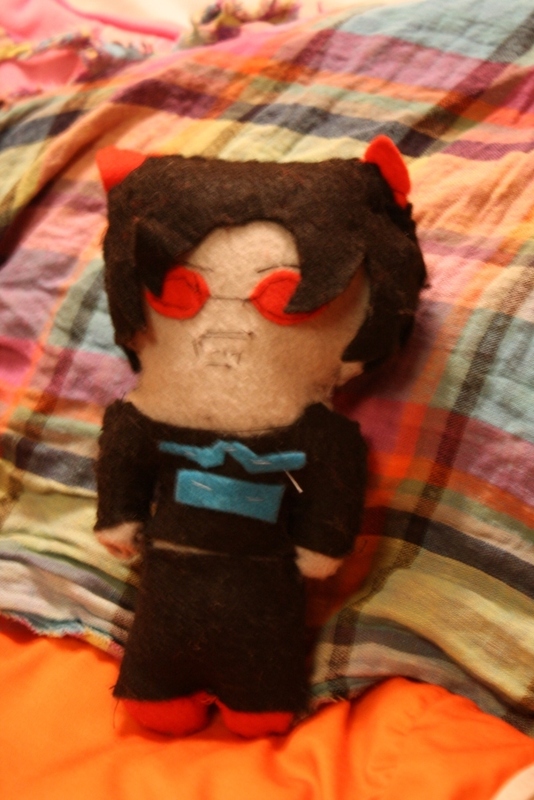 Anyway, while I don’t have a pattern for all you seamstresses and effeminate man-stitchers to copy this paragon of thread and needle, I do have a gallery so you can get a closer look at this Terezi Pyrope doll.